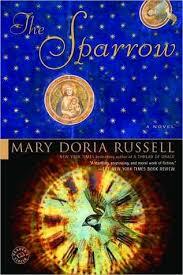 Number 5: The Sparrow/Children of God duology by Mary Doria Russell – These books were re-reads for me this year, but like the first time read them (at least 10 years ago), I was deeply moved. These books ask the question: Can we believe in a loving God in the midst of suffering?” This, of course, is a question asked by Christians and non-Christians alike. These books will blow holes in all of your assured answers about God and suffering. They will also, however, make you feel like you could find a loving God out there somehow. Here’s a great quote about the main character: “He had also discovered the outermost limit of his faith and, in doing so, had located the exact boundary of despair. It was at that moment that he learned, truly, to fear God.” Note: These books are futuristic and are about interplanetary travel. However, if you’re not a sci-fi fan, don’t let that keep you from trying these books, which are not just about science, but are also about faith, deep questions, love, loss, pain, knowledge, and life. Two of my favorite books ever. 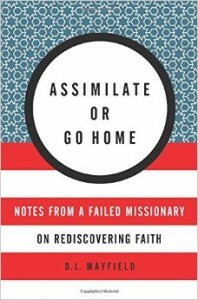 Number 3: Assimilate or Go Home: Notes from a Failed Missionary on Discovering Faith by D.L. Mayfield – I have been reading Mayfield’s blog and online writings for a few years now, and I was stoked to have her book in my hands! Mayfield writes about living among poor refugees, and though she came to bring God to them, they brought God to her and taught her more about faith and life than she ever expected. Though this is a book of moving nonfiction essays, I call this the best theology book I’ve ever read. All the highfalutin theologians need to read Mayfield’s truthful book. Her writing is humble, prophetic, and striking. 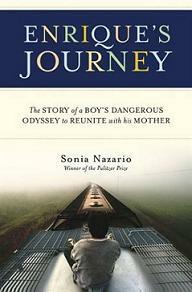 Nelson has a unique and poetic writing style that is so moving. That’s what really makes her books stand out. 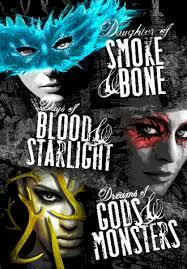 Number 1: Daughter of Smoke and Bone Series by Laini Taylor – This series is one of the best YA series I have ever read! 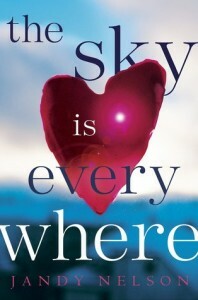 I loved the characters, character development, world-building, and twisting plot. Set partly in our world and partly in a fantasy world, these books trace both the history and the present journeys of three types of creatures: angels, chimaera, and humans. Another impressive part of this book was the language. Though I love YA, sometimes the writing in YA books is a little simplistic, but this author knows how to write YA with beautiful, intelligent prose. This was probably the first series I’ve read in which the second and third books are just as good as – if not better than – the first. In most series, I love the first book and think the other books are pretty good, but never as good as the first. The best thing about this series was how its themes are completely applicable to today. Thematically these books were about “the other” in society – how do we learn to trust people different from us? Is it possible that we have the same values as people from different backgrounds? Can we learn to value, appreciate, and even work with “the other” toward a common goal for society? These books address those questions, and they reinforce my firm belief that fiction books are not just escapist, but have the power to affect and shape our lives in the real world. Also, I think I will finish Bright Morning Star by Madeleine L’Engle by December 31! Obviously my reading was YA-heavy this year. What great books did you read this year? Any suggestions? So, the fact that you read 45 (?) books in 2016 and I read 38, and none of our books overlapped is an amazing comment on the continuing great books being written and published today. Also we’re from different generations. But we’re both Southern. And converts to Orthodoxy, although I don’t think that informed much of our reading in 2016… not much of mine, anyway. Fun seeing your list. On to 2017!